Make Your Own Pregnancy Pillow With Your Designs. Handmade in the UK. Keep both mum and baby happy and make your own pregnancy pillow, to stay cosy and comfortable with an extra splash of style. With four areas to personalise you can make your new pregnancy pillow unique to you, by adorning it with your own photos or artwork. Handmade in London using luxury super soft velvet fabric and firm padding, we’re sure you’ll love your new bedroom accessory. If you’re expecting or want to give a loving gift to a mum-to-be, make your own pregnancy pillow for the ultimate comfort cushion. Our large pregnancy pillows are designed to make sleeping on your side extra comfortable and easy, aiding those muscle-aches along the way. Design the pillow using your photos or original art designs to create a unique cushion that will complement your bedroom décor or personal style. Celebrate pregnancy with a beautiful and vibrant cushion featuring your designs rather than settling for the classic plain white options on the market. Keep baby and mother comfortable and cosy with these super soft, velvet fabric cushions with sumptuous padding. 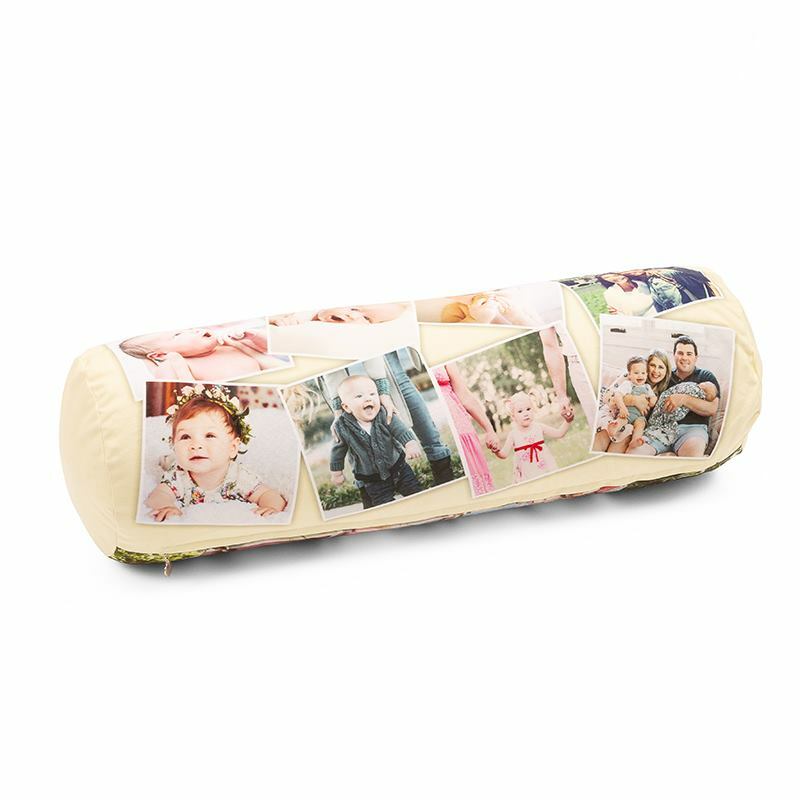 This time i ordered the xl bolster, wow, i have photos of all my pets(babies), turned out so beautiful, I've had scarfs, tins, cushions, Xmas ornaments etc, the standard of quality is excellent, service excellent, highly recommend. Fast efficient beautiful as always. I am always impressed by the turnaround times and quality of printing from bags of love. The pillowcase material I don’t like much but the print quality is fab, will buy again from them, no doubt. Such a comfortable pillow, really helps with my back support while i'm expecting twins!!! love that you can put different designs on the different sides too. This pillow is firm, yet soft, providing extra support for mums to be whilst still being comfortable and soft to the touch. Filled with a plump feather padding, it’s the ideal way to relax whilst pregnant or sleep easily in the recommended positions. The large nature of the pillow gives it a versatile nature – it can be used for added back support while sitting up, comfort while sleeping, or simply as a beautiful new home furnishing. Who Will Love These Pregnancy Pillows? These are of course loved by mums to be, but it doesn’t stop there. Once the little one has come along, these large cushions make the perfect pillow for snuggling up to as a family. Cuddle up together and start brand new memories together with the comfort of your new luxury cushion. As well as pregnant women, these pillows are loved by anyone who spends a large portion of time sitting up on the sofa reading, or even at your home office. The lovely soft velvet cover will be printed using professional level printing techniques, which embed your images deep into the fabric fibres. This results in a beautifully vibrant print, with an even tone. Your design won’t fade over time or scratch away, and can be customised in four areas – the front, back and two ends. Printed, cut and sewn to order, our talented seamstresses then sew your new cushion in our London-based factory. With extra attention to detail, every piece is made with the utmost care to give you the highest quality pillows. Do you have an ultrasound scan of your new baby? Why not make it a special memory pillow, and print the ultrasound image alongside your baby’s gender, current weight and name. Even after pregnancy, it will make a beautiful keepsake from this special time. If you’re after a pillow to match your current home furnishings, explore the colour palettes throughout your home. Choose tones that will compliment your current décor, whilst still adding an extra pop of colour or bold print. Make travel more comfortable and free from neck pain with our personalised travel neck pillow. Neck cushion, travel pillow.